Writing in Public - What Happened? 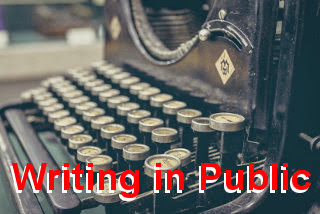 Almost a year ago, I decided to mimic the Writing in Public series of blog posts that author Dean Wesley Smith has been doing for over two years now. I thought it might motivate me to write more if I knew that my success or failure to write was public - and that people I knew (and didn't know) would hold me accountable. For a while, that illusion of accountability helped. I managed to write over 300,000 words. That's probably more than I had written in any prior year. So Smith's idea definitely helped me. The problem, though is something Stephen Guise mentions in his Mini Habits book. Motivation can make us do amazing things, and amazing amounts of work in a short time. But motivation is fleeting. We can be highly motivated today, and totally unmotivated for six months. Relying on motivation or inspiration to build a writing career is futile. It's not consistent enough. If you have actually looked at my writing statistics for the past year, you'll see evidence of that. Guise suggests that habit is a better foundation, and I think he's right. Forcing yourself to sit down every night and write as much as you possibly can will only work to a point. Eventually, you'll grow tired of the activity and the desire to do almost anything else will win out. That's what started to happen to me in August and September. I will sit at my keyboard for one minute each night, even if I do not write a word. I will take one minute each day and think about a novel I want to write. What you're reading now is my "one minute at the keyboard" for today. I've been at this far longer than a minute, but the mini-habit is a success for today. When I publish this post, I'll put in that one minute of brainstorming about the novel I plan to write for NaNoWriMo next month. I might jot down notes, or I might simply read over notes I've already made, but I'll put in my minute. So, from here on out, no posts about word counts. No posts about why I didn't write anything. In other words, while I am grateful to Dean Wesley Smith for having motivated me to write over 300,000 words over the past year, I'm falling off that particular wagon. I need to make my writing a habit. I hope you will wish me luck and success, as I do for anyone reading this post. I wish you luck and success as well. It's amazing how such a little amount of time can jump start our brain! 300,000 words in a year... pretty impressive!